So the Consumer Electronics Show is over for another year, and for those who’ve been in Las Vegas covering it for us, it’s back to normality. While we allow the Cult of Mac team to sober up, it’s time to look back at the best gizmos CES had to offer. There were thousands of products on show — far too many to cover in one week — but there were a handful that really stood out. We’ve put together a list of awesome things that we were blown away by, including smartphones, accessories, gadgets, and more. 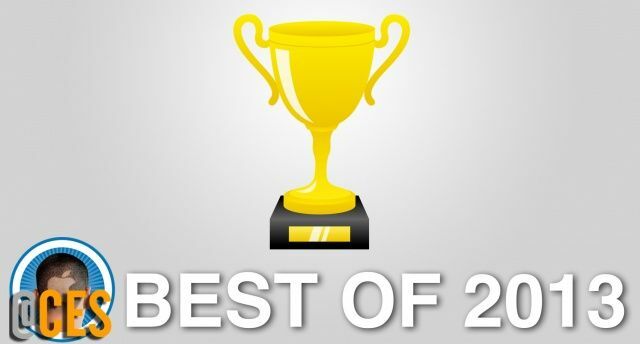 Check it out and tell us what you’re most looking forward to getting your hands on in 2013. Although there weren’t a huge number of smartphones on show at this year’s show, there were a small handful of devices that really impressed us. Our best smartphone pick almost went to the Sony Xperia Z — it’s a terrific handset — but we felt the ZTE Grand S just about edged it. Not only is it the world’s thinnest 1080p smartphone, but it offers a speedy 1.7GHz Snapdragon S4 Pro processor, 2GB of RAM, 16GB of internal storage (plus a microSD card slot) and LTE connectivity. 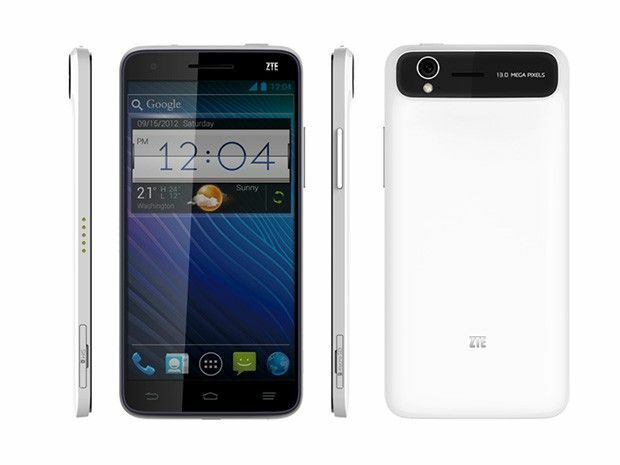 It also has a 13-megapixel rear-facing camera, and a 2-megapixel front-facing camera. 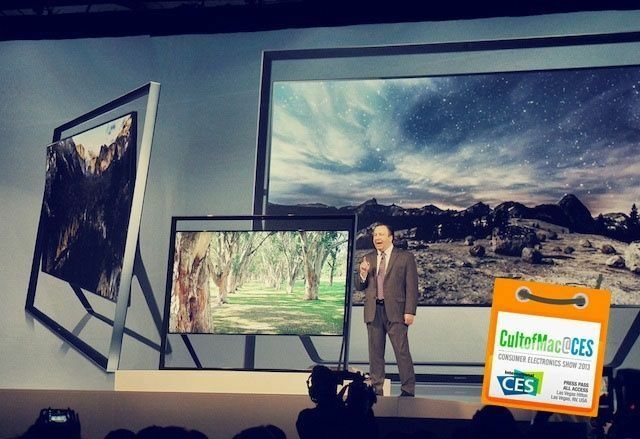 Buster wasn’t a huge fan of Samsung’s crazy ‘easel’ television, but i’s hard to deny it was the best on show at CES. Measuring 85 inches diagonally, this set offers a ultra high-definition 4K resolution, integrated speakers, and a unique form factor that’ll look incredible in any modern living room. The only downside? It’s going to cost around $30,000. The MakerBot Replicator 2X is an advanced 3D printer that can print complex 2-color models and is optimized for ABS plastic. It prints at a resolution of 100-microns (which is pretty good for a prosumer 3D printer) and has two extrudes for printing two colors simultaneously. Whereas the Replicator 2 uses a biodegradable PLA plastic (made from corn), the 2X is optimized for printing with stronger ABS plastic, which is the most common type of plastic for consumer goods. It can print in multiple colors and multiple kinds of plastic. One MakerBot engineer showed off an iPhone case he made himself in about 90 minutes at a cost of a few cents (if you ignore the cost of the $3,000 printer). And the best part? 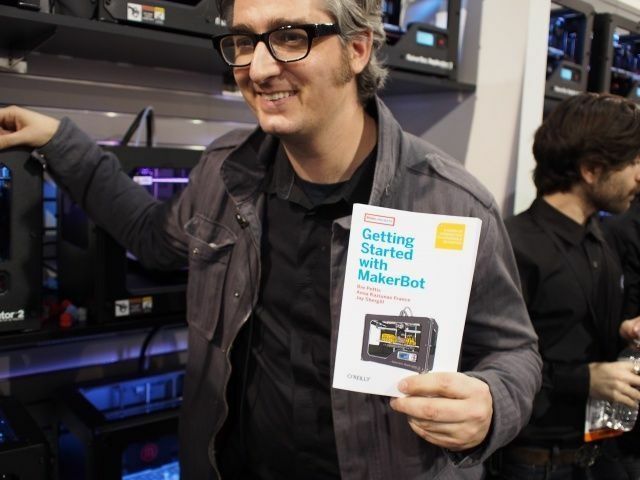 MakerBot released a printer API and expects third-party software makers to create software for the iPhone and iPad to run its printers. 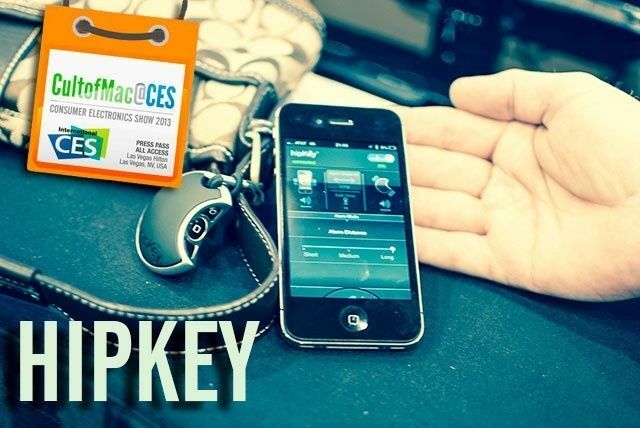 Hipkey creates a sort of blood bond between a dongle and your iPhone. The possibilities after that are pretty rich: not only can it help you find a lost iPhone, or a lost set of keys, but you can even do things like help find a missing child or be alerted by a pickpocketed smartphone with it. The actual tech behind the Hipkey is pretty simple: it’s basically just a Bluetooth dongle that you pair with your iPhone that freaks out when the two find themselves outside of a certain range of another. The presentation is an attractive crescent moon with easily thumbed controls, and Bluetooth 4.0 low energy mode guarantees that you can keep your iPhone and Hipkey paired for a long time without noticing a bump against your battery life. Hipkey has some secret sauce, though, and it’s all in the app. The app has multiple modes for different use cases. For example, you can do the obvious and tell Hipkey to start freaking out when your iPhone and the dongle find themselves separated by more than, say, 50 meters. Likewise, it can be used to find your missing iPhone, or likewise, your missing keys. Thing your new Android handset is a powerhouse? 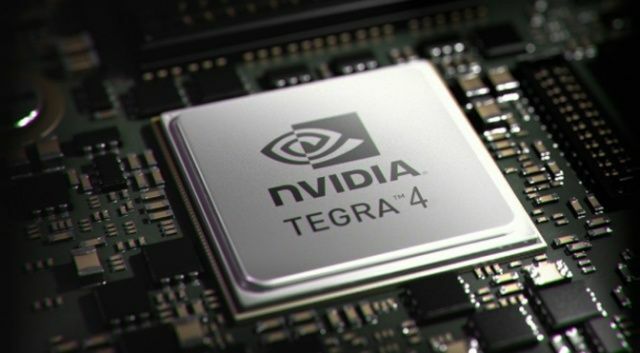 Believe it or not, the next-generation of smartphones and tablets are going to be even better, thanks to NVIDIA’s new quad-core Tegra 4 processor, which boasts a 72-core graphics processing unit. When the Tegra 4 was leaked last month, some questioned whether we really needed processors this powerful in mobile devices at this point. But even basics like web browsing can be vastly improved. NVIDIA pitted a Nexus 10 tablet, which Huang called “the fastest tablet in the world today,” against a tablet with a Tegra 4 processor on stage at CES. Both devices were to load 25 high-traffic websites. The Tegra 4 tablet completed the task in 27 seconds, while the Nexus 10 took 50 seconds. The processor could also improve HDR photography. Huang noted it takes around two seconds for Apple’s iPhone 5 to capture a HDR image, while the Tegra 4 can to the same thing almost instantly. BlueAnt Wireless showed off a tiny little device at CES this year called the Ribbon, which they claim can turn almost any speaker into a Bluetooth streaming device. BlueAnt describes three ideal use cases for the device: First, the device can be used to clip onto your clothing in order to stream audio from your iPhone to a set of headphones. Second, you can use it with your car stereo to stream audio from your iPhone through your car’s speakers. And third, you can plug it into any set of speakers in your home and stream music to them wirelessly. Lego showcased a new version of its popular Mindstorms robotics kit at CES that adds some incredible new technology: the ability to control your robots from your smartphone and tablet. The heart of the EV3 is powered by Linux, which allows the creator to program the creation remotely for the first time. 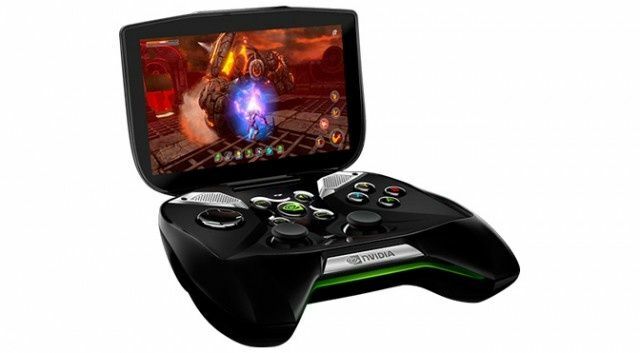 NVIDIA surprised us all with Project Shield, a brand new handheld gaming system that’s powered by Android. This isn’t just a beefy tablet; it’s a physical controller with a built-in 5-inch display that’s likely to transform the way you game on the go. The best part is that it has the ability to stream full PC games from a desktop computer. And as you’d expect, it’s running NVIDIA’s new Tegra 4 chip. Fitness technology company Fitbit unveiled the Fitbit Flex at CES, a new Bluetooth wristband for fitness fanatics. It tracks your daily activities and keeps a record of every step you take, the distance you’ve traveled, and how many calories you’ve burned. It even monitors the quality of your sleep. It then sends all that data to your smartphone, where you can track your progress. If you frequently travel with a suitcase or backpack full of gadgets, the Cocoon IQ Collection is simply a must-have. It’s basically an organizational grid covered in straps that you slip your gadgets into to stop them rolling around in the bottom of your bag. You can use it for almost anything you like, including cameras, cables, media players, tablets, notebooks, smartphones, and anything else you can think of. Fisher-Price’s Apptivity Case is a new iPad case that’s not only rugged and child-friendly, but also offers an integrated handle and stylus. It will be accompanied by a number of iOS apps that’ll turn the case into a fun educational experience, with drawing activities, augmented reality games, and lots more. 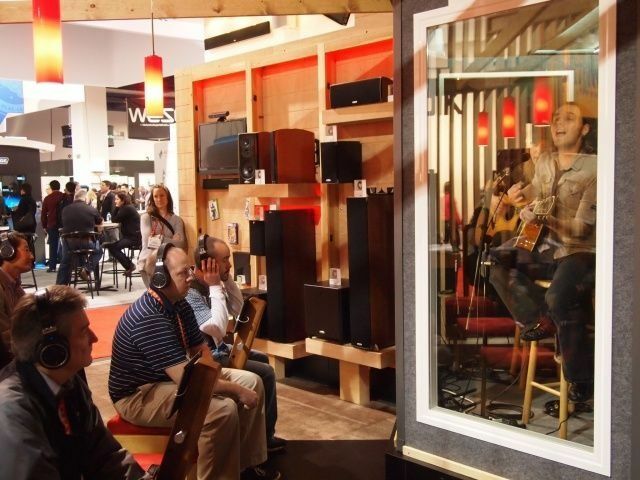 Polk Audio had singer Mike Ruocco performing in a soundproof booth, and the only way to hear him was to stick on a pair of the company’s $349 Ultra Focus 8000 headphones. It was a very cool idea that attracted a lot of attention, and as the sales reps pointed out to Cult of Mac, they could still hear and talk to prospective buyers.